Kelda writes- Keeping Things in Perspective! It’s been a pretty brutal few weeks of training….and so it should be – we’re talking about the Olympics, not a village fete!! I’ve pushed myself to my absolute limits over the last couple of weeks, and just when you get to the point that you think you have nothing left, you find a bit more! As my great friend and 5 x paralympian Marc Woods keeps telling me….”that’s where the medals are won!” I’ve had to keep reminding myself of that at those times when my heads gone down and I’ve just wanted to stop….and there’s been quite a few of those I can tell you!!! But the awesome thing is, when you keep pushing through, in time, the gains start to happen. I’m feeling a little broken but strong, and I’m excited about the impact that all this will have on my paddling. I’ve set myself some pretty ambitious goals for 2016, but I’ve got a new found confidence about making them happen! Sometimes you can become a little bit obsessed and all consumed in training, but last Friday I was able to put things very much back into perspective. I attended the Midlands Children of Courage Awards, where two young people from Climbing Out had been nominated for awards. It was an amazing evening with so many inspiring and incredible stories. I was so proud of all the young people that attended the awards to support Chelsey Dixon and Molly Evans, the two girls nominated. The friendship and support that was so evident between all of the young people was something very special to see and made me realise just how much long term impact Climbing Out is having on the lives of the young people we work with. It was a very special evening, with Molly winning “Fundraiser of the Year” and Chelsey winning the “Stephen Sutton Award”. 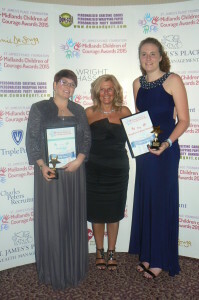 Chelsey’s award meant so much, not just to Chelsey, but to all of the young people attending. Many of them had known Stephen before he died, and in the past they’d often talked to me about him and I could always tell how much they thought of him. For Chelsey to win the award in his memory was a very special moment, and I know how much it meant to all the young people to talk with Stephens mother at the end of the evening. Thank you to The St James’s Place Foundation for hosting such a special night. Gold medals of course play a massive part in my own personal journey at the minute, but when you meet such inspirational young people and appreciate the challenges they’ve overcome and the incredible things they’ve achieved, it really does keep your feet on the ground. Yes, medals are important, and I’ll be doing my utmost to make that happen, but let’s never forget to keep things in perspective. This entry was posted in Blog, Kelda Writes on November 9, 2015 by Ruby. Kelda writes-Sponsorship to help me do this, and the reaction from people has just blown me away. Well, the 3 week break is nearly over….and that means we’re about to start the season that will culminate in the Paralympics next year! That’s an incredibly exciting thought….but a pretty scary one too! It’s time to focus 100% on Rio. Everything I do, think, eat and sleep will be with Rio in mind. I’ve been working hard throughout the break trying to secure support and sponsorship to help me do this, and the reaction from people has just blown me away. East Midlands Civil Engineering Ltd is a Midlands based contractor with considerable experience in roads, sewers and ground works. They have sponsored me with £1,000 of financial support, a massive help now I have committed to training full time. The money will go directly towards training costs, so again this support will big a big help in enabling me to deliver the best performance possible next year. A big shout out must also go to Geoff Ward film and photography. It’s the film that Geoff kindly put together that has lead onto much of this additional sponsorship, so a big thank you to him. People say “teamwork makes the dream work”, well blimey, I’m feeling some team behind me at the minute! The support people have given me has been simply incredible and I feel very very lucky to be surrounded by such amazing people. Talking of amazing people….having a 3 week break gave me the opportunity to go up to the Lake district to help run our very first Climbing Out Level 2 programme. And you couldn’t meet a more amazing bunch of young people than the ones we had right there! The programme was for young people who had already attended one of our 5 day programmes, and to see how much they’d all grown in confidence and developed since they’re first programme was something very special to be part of. The atmosphere, friendships, support, banter and willingness to be challenged throughout the week was inspiring, and to stand back and watch the guys take ownership, make decisions, run activities and support each other is something I will never forget. The most fantastic thing is that we’re developing a team that can continue to deliver the Climbing Out programmes long after I’m too old and decrepit to be doing it any more! They in turn, can then develop a team to keep it going when they move onto other things. In doing this, we are creating something that will have real longevity, and will continue to affect the lives of young people long into the future. And if we’re looking at challenges….October is going to be a month full of them for me! I start with performance testing next week – where I intend to smash the backside out of everything that’s asked of me!! :-) The following weekend I’m off to race in a regatta with Warwick Sprint Canoe Club, a great opportunity to challenge myself and see if I can put right what went wrong in September. On October 7th I have my formal review where I will be fighting hard for my place on the squad, then on the 9th I’m off to the Wigan Sports Awards to be their guest speaker for the evening. This will be a very different challenge to the physical ones of the weeks before, but one I am looking forward to all the same! On the 15th October I’m being interviewed on Big Centre TV, then on the 23rd I’m attending the Midlands Children of Courage Awards to say a few words about Climbing Out, and hopefully see 2 of our participants pick up awards for which they’ve been nominated. A busy month, but an exciting one too! Aside from all of that I’m going to be working harder than ever in the gym, on the water and in my mental preparation for the coming season. There’s everything to play for as we start the final 12 months to Rio. This entry was posted in Blog, Kelda Writes on September 25, 2015 by Ruby. So the season officially ended for us last Saturday with our final regatta of the year. As I’d mentioned in my last blog, this was my ultimate chance to prove to the coaches that I was capable of delivering under pressure, and I could transfer what I’d been producing in training in a race. Yet again I was reminded that this isn’t a fairly tale, and the nature of sport can be pretty harsh! I produced an average performance, finishing 4th in my heat in a time of 56 seconds. This qualified me for the B final, where I again did a time of 56 secs. This is a mediocre time, nothing special, nothing horrendous…..but what it didn’t do was prove what I knew I was capable of. I’ve been delivering consistently times of 53/54 secs over the last few weeks, but I allowed myself to get distracted, and this showed in my race. I’m more annoyed with myself than anything….this was my chance to show them what I can do and I messed up. I let myself down from a mental perspective, I failed to get focused before the race and this put me in a position that I was easily distracted in the race. Over 200m you just can’t afford to do that! However, I’ve been able to reflect on my performance and I know it was yet another massive step in the learning curve. I will NEVER let that happen again, and I believe there is a lot of work I can do myself, with my coach and with our team psych to help me with this and make sure I don’t loose that focus when it comes to racing next year. Unfortunately I didn’t do enough to leave the coaches with no questions about my potential for next year. I now have to wait until the formal reviews in October to find out their decision on my funding and whether I will go to the training camp in Brazil in January. Nothing like drawing out the agony!!!! I see the Brazil training camp as a vital step in the preparation for Rio so I’m keeping every little bit of me crossed that they believe in me enough to take me along. However, if they don’t, it’s not the end of the world, and it’ll be time to pick myself up, brush myself down and keep fighting…..again!! It’s less than 9 months now until the selection regatta that decides who will be in the boat that goes to Rio. As soon as we return to training on the 28th September it’s going to be full on, with every athlete on the squad having their focus on that regatta and the Paralympics 3 months later. It makes my stomach churn when I think of what’s to come over the next few months….it’s exciting, but daunting at the same time. I watched an incredible film at the weekend called “Unbroken”. It’s a true story about an Olympic athlete called Louis Zamperini that ends up fighting in World War 2. He gets captured by the Japanese Navy and is sent to a Prisoner of War camp. He endures some brutal treatment, but shows a remarkable strength of character and resilience to survive. When he was an athlete, his brother said to him “If you can take it, you can make it” and it was these words that kept him going. I had to have a little word with myself…..so no matter what happens in October, I will take their decision, and I will take whatever the next 9 months throws at me. If I can do that, train hard and stay focused, then I will give myself the very best chance of being the one that makes it! This entry was posted in Blog, Kelda Writes on September 13, 2015 by Ruby. Kelda writes- I also have to say a big thank you to Geoff Ward film and Photography…. After the setback of not being selected for the World Championships, I’ve eventually got my head around things, and I’ve come back feeling stronger and more determined than ever.….and it’s working!! I’ve hit a PB (Personal Best) for the last 3 weeks and I’m now just over 1 second off the time I need to hit by September to stay on the pathway to Rio. It just shows how sometimes, when things don’t work out, it can actually be for the best. Would I have the same fire in my belly if I’d been selected for the Worlds? I really don’t know! I also have to say a big thank you to Geoff Ward film and Photography. Geoff kindly offered to put a short promotional film together to help me in my mission of raising the funds to enable me to train full time leading up to the Paralympics next year. On top of all of this, it’s been an incredibly busy time for Climbing Out. We’ve got 3 programmes running over 5 weeks working with nearly 50 young people. We’ve been able to offer places to young people in recovery from cancer, kidney disease, and for the first time we’ve been able to offer places to 2 visually impaired girls. It still blows me away to see the impact the programmes have on the young people and the achievements they all make. It is inspiring to see, and the friendship and support they give each other is something very special. I’m hoping for an eventful week….with the Climbing Out programme running in the Lake District with 17 young people in recovery from cancer, news should arrive about the potential sponsorship, the film should be finished and ready for promoting…..and I’ve a time trail on Friday where I have every intention of giving it my all and aiming to get that time of sub 54 seconds!! This entry was posted in Blog, Kelda Writes on August 4, 2015 by Ruby.